"You can make these ahead several days and store in the fridge. If baking cold, let stand 30 minutes first." Place potatoes in a large pot of lightly salted water. Bring to a boil, and cook until tender, about 15 minutes. Drain, and mash. In a large bowl, mix mashed potatoes, cream cheese, sour cream, milk, onion salt, and pepper. Transfer to a large casserole dish. Cover, and bake for 50 minutes in the preheated oven. Make the holidays easier on yourself with mashers you make ahead of time. We have made this for many holiday dinners. You can also put these in a crockpot for 5 to 6 hours. It's a great way to keep them warm without the hassle of watching over them! 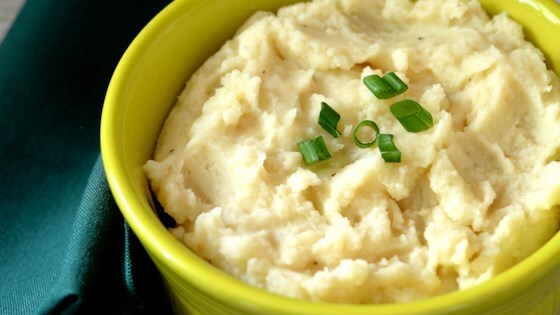 This mashed potatoes were a great basic, easy recipe. The only thing I added was one stick of butter. I did not bake them, I made them the day of and kept them warm in the crock pot. These were awesome mashed potatoes. I made the potatoes the night before. Instead of heated them in the oven I put them in a crock pot on low. I added milk and butter to remoisten.